If you’re a web developer you’ve probably had way too many ideas for way too many amazing projects, and you’ve promptly gone out and registered domain names for each one of them. That feels like progress, right? But before long, you’ve got a domain registrar account with 100 random domains that are auto-renewing for $16 every year. Obviously the best way to save money is to let some of those domains expire, and I’ve gotten a bit more realistic about the ones I’ve held onto. I still have quite a collection of family names and actual honest-to-goodness projects that made it beyond the “what-a-great-idea-go-register-it!” stage. So my annual registrar bill does look scary when I add it all up around income tax time. Cloudflare came down the chimney with an early Christmas present, however. And it’s a big one. If you’re not familiar with Cloudflare, they create a layer between your actual web hosting and the visitors that show up to view your content. That layer acts as both a CDN and a security service, so Cloudflare accelerates your website site performance and protects it from (among other things) DDoS attacks. They do this by taking over the DNS for your domain, directing requests through their servers first to cache and deliver your content. You still need to host your site somewhere, and you still need to register your domain somewhere, but by putting Cloudflare between visitors and your site, it’s like having a bouncer at the door that helps move everybody in and out of the business faster and keeps the riff-raff outside in the snow. Anyway, back to Cloudflare’s Christmas delivery. Cloudflare announced that they were rolling out domain registrar services, and even better that they would be providing close to wholesale rates to Cloudflare customers. What this means for us compulsive domain name collectors is that you can get rates closer to $8 instead of paying $16+ for our precious domain gems each year. Plus, since I’m using Cloudflare for most of my live sites anyway, it’s one less place to deal with accounts and record changes and those bizarre who-is-serving-what questions that come up when you’ve got 37 domains online. 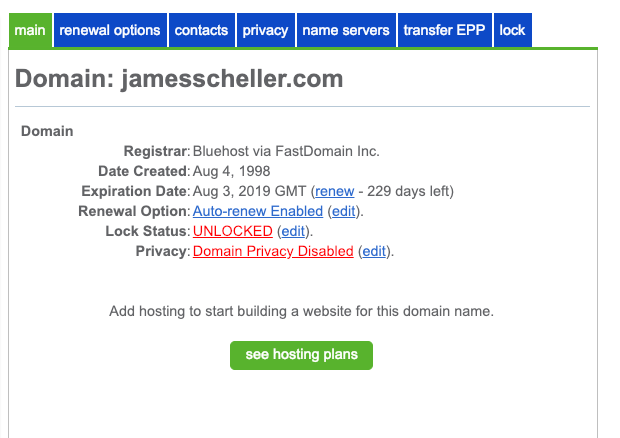 I’ve been registering domains at Bluehost, which I know isn’t ideal from either a management point of view or pricing. I started there back when their registration rates were a lot more reasonable, but it’s gradually become a profit center with add ons like “registration privacy” and other services. If only some of that money had gone into updating their web UI for managing domains, the last ten years of escalating registration fees might have felt less like a mugging. Navigating the interface to get your domains moved from Bluehost (or perhaps similar other commodity hosts like GoDaddy or 1&1) to Cloudflare can be a little unruly, so this post will quickly walk you through the steps. I’ve moved roughly a dozen domain registrations to Cloudflare now and it’s fairly painless, but you do have to go back and forth between the sites a bit to actually complete all the steps, and even Cloudflare’s service (which is still a bit new) can be less than clear in a few spots. Hopefully this post will save you some trouble if you’re making the same changes. Note that even if you’re not hosting your actual website at the site where you register your domains, you can still move your registrar and DNS services to Cloudflare. Because your domain registrar and DNS and the actual web site hosting are different services, it’s relatively transparent which you move things around. That said, if you are doing some non-standard DNS things, or you frankly have no idea what DNS does or how it works, this might be an opportunity to learn or ask that techie buddy of yours to glance over your site before you jump in. Create a Cloudflare account if you don’t have one. Activate your site on Cloudflare to start serving DNS records from Cloudflare instead of your current host. Enter Cloudflare’s DNS server names at your current registrar to point your domain to Cloudflare. Make Sure Your Site is Working! 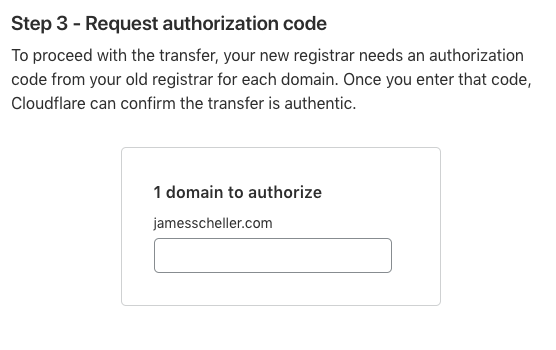 Start the registrar transfer process, including entering the domain’s transfer authorization code. Go back to your registrar and confirm that the transfer to Cloudflare is okay. This is the step that’s easy to overlook. Go back to Cloudflare and verify it’s now the registrar. Let’s go over these now in a bit more detail. If you don’t yet have a Cloudflare account, go to their home page and click the “Sign Up” button and go through the usual email verification steps. 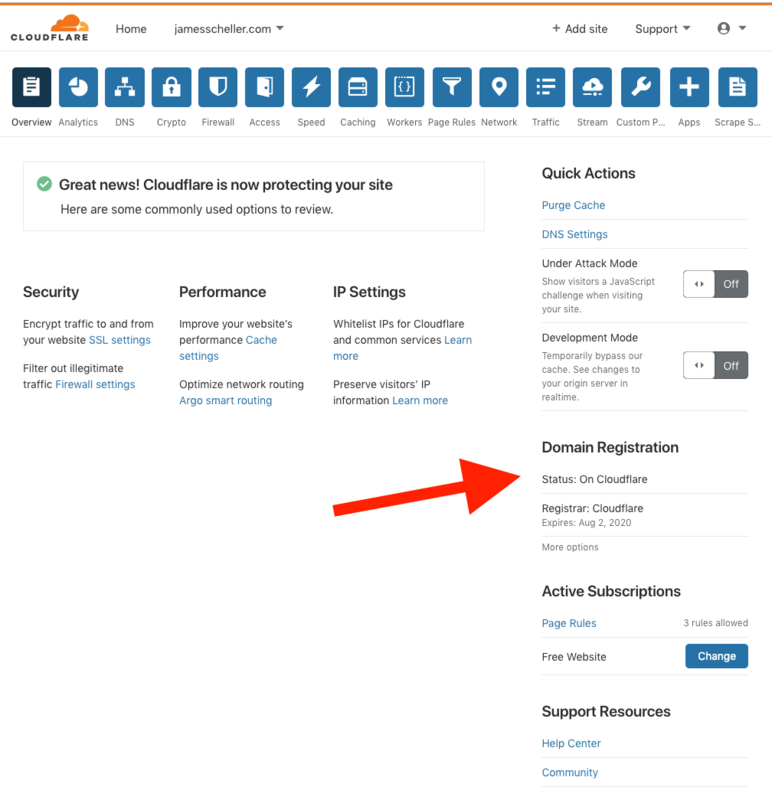 Once you log into your Cloudflare account, you need to add your site to Cloudflare by clicking the “Add site” link near the upper right part of the page. This turns on all the Cloudflare wonderfulness for your domain, but doesn’t get you yet to the actual registrar part of the process (we’ll cover that in a second). Again, the free plan is probably all you need. You can upgrade to plans that offer a few more performance enhancements and security, but if you’re coming from bare-metal hosting somewhere else, the free plan is already a huge infrastructure upgrade. As you go through the steps to activate your site, Cloudflare will scan your current DNS records and make a copy of them to serve in place of your current DNS provider. It will get everything ready to redirect your site through Cloudflare’s servers so that the CDN and security features will be activate once you change the DNS server names in the next step, but nothing up to this point has changed the way your site is currently being served. Your site is still being served exactly the same way it was before because it’s still going through whatever DNS services are in place. To get Cloudflare to recognize that your site is “active” you need to change the DNS name servers. These are entries at your current registrar that tell the whole of the internet how to resolve names to IP address for your domain, and by changing these server names Cloudflare is able to tell that you actually own the registration for the site. At the end of the site setup process in Cloudflare, you’ll get a page that shows you the new DNS server names. You can also find these at any time by looking at the “DNS” tab when you’re managing any particular site in Cloudflare’s dashboard. 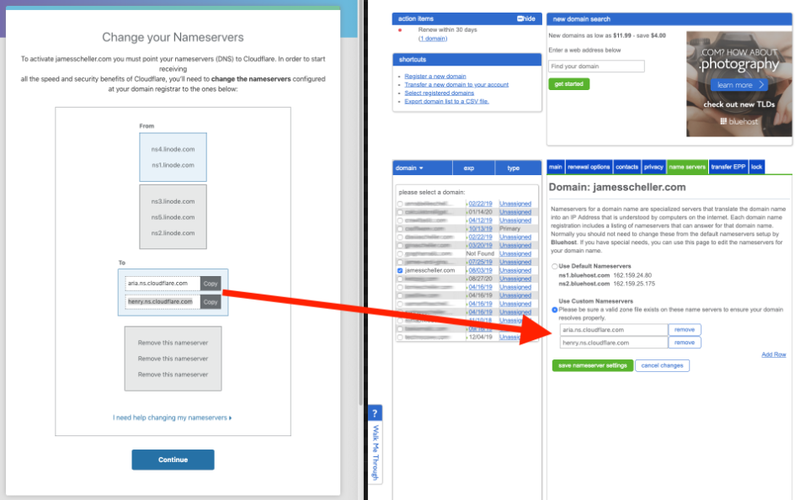 The place you enter these new DNS server names is on the “Name Servers” tab inside Bluehost. It’d be useful to keep track of the existing values you have there just in case you want to roll things back. Verify your site is working as expected, including any other services like emails or APIs. Again, Cloudflare should have copied your existing DNS records and updated them appropriately, but this is your chance to figure it out. If something seems out of whack, put the old DNS name servers back in, wait for propagation and then dig deeper to see what’s going on. Putting the DNS server names back as they were will restore everything exactly to as it was before (Cloudflare is completely bypassed) so this can function as a clear on/off switch if anything is misbehaving. But if all goes well, at this point, Cloudflare is providing its CDN and security services for your site and we’re ready to move to updating the domain registrar. …but you may see a similar message inviting you to “claim your place in line” for an invitation. Cloudflare is still rolling this service out in scheduled waves so they don’t get overwhelmed, but as of this writing you should only be waiting a week or two to get through the queue, and hopefully it will be wide open shortly. If you are in the queue, you’ll need to log back in to Cloudflare periodically to see if the registrar functionality has opened up to you or not… They don’t seem to send an email or any kind of notification once you’ve reached the front of the queue. Assuming you can register the domains, Cloudflare will let you select which active domains you want to transfer from Bluehost to Cloudflare. It will default to a list of all active Cloudflare domains. Cloudflare will need a credit card and billing details during this process. It will charge you for one year’s domain registration as part of the transfer process. This is typical when transferring domains between registrars. Note that “Lock Status” entry in the middle. If it shows “Locked” it will prevent a transfer from happening, and you should click “Edit” there to go to the lock panel and then choose to unlock the domain. I’ve had mixed results with the correct lock status showing there right away and it you have trouble it may be worth logging entirely out of the Bluehost interface and logging in a minute or two later to verify the change has taken effect. It’s not clear to me whether attempting to unlock the domain repeatedly when the status is showing “Locked” is toggling the state or consistently unlocking it, but it’s definitely a little flaky for me. Note that I’ve shown the actual auth code in my screen shots here, but you should NEVER share this code publicly from your live registrar. 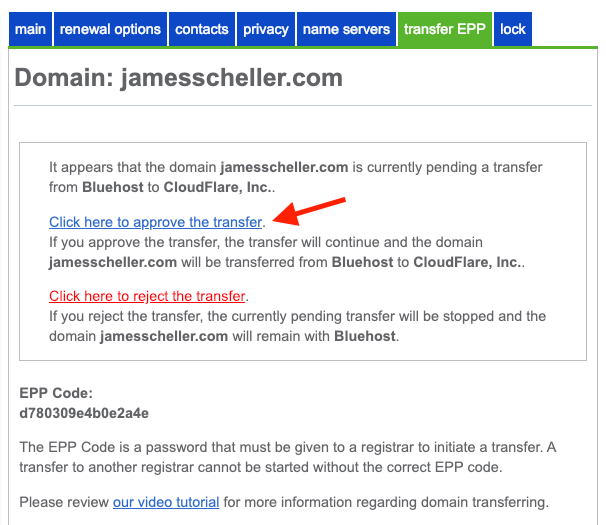 Since I’ve already completed the domain transfer from Bluehost to Cloudflare, the EPP code here is essentially dead, but if you had a live site, that code would potentially let someone request a transfer of your domain. Whoops. …and that leads us to an easy to overlook step. The error message in Cloudflare suggests that you didn’t copy the right EPP authorization code in, but in reality it’s simply complaining that the transfer was rejected by Bluehost. 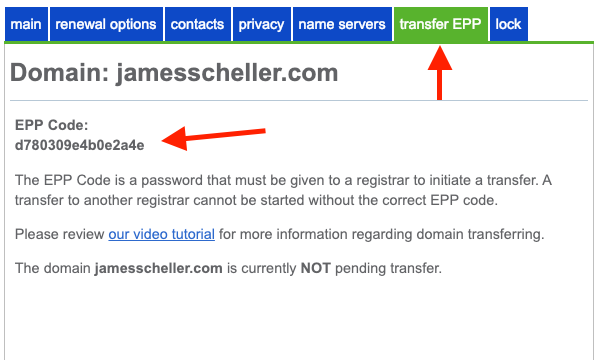 If you go back to the Bluehost transfer EPP tab, you’ll see something a bit different now. 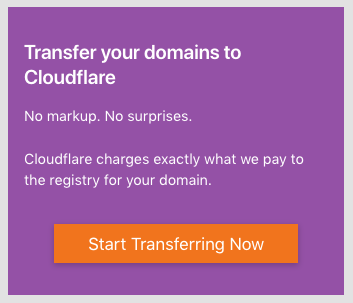 In addition to showing you the EPP code again, Bluehost is making darn certain that you want to stop paying those over-priced registrar fees, so it’s blocking the transfer to Cloudflare until you click that blue link. So click away. I’m not affiliated with Cloudflare, but I’m a huge fan of their service. Their new registrar is going to be game changing, and it’s incredible how much money I’ve spent over the years as traditional registrars have raised fees. Cloudflare’s registar service is still new and has a few hiccups. I don’t see an obvious way to register an entirely new domain name yet, so it seems you can only transfer existing registrations. Maybe that’s a ploy to encourage people to take advantage of those introductory loss-leader registrations many other services offer. And it looks like right now transfers out of Cloudflare require a visit with customer support, so it’s probably not a great place for active domain traders. But if this service is like everything else they do, Cloudflare’s registrar going to get a lot better a lot sooner and I’m pleased to be coming to one spot now for my CDN, DNS, security and domain registration. And I’m frankly looking forward to sending these guys more money once my sites get large enough to justify some of their higher performance add-ons. Meanwhile, thanks Cloudflare, for making another corner of the internet a little nicer. When your livelihood is tied to website traffic, one of the worst things you can wake up to is an email from Google Search Console. I’m no stranger to bad news from the Big G and the non-communication and horror movie circular forward-you-to-the-right-group conversations that go along with any dialog you might think would rectify the problem. I spent six months trying to get my site off the AdExchange blacklist because of a minor AdWords violation on an account I didn’t even know was still serving $10 per month worth of ads. Which sounds insane, I know, because my ancient AdWords account should have nothing at all to do with my display partner’s Ad Exchange account, but believe me… What a mess. In that case, I was fortunate that a friend-of-a-friend-of-a-friend had a direct Google rep with a back-door into some super-secret re-evaluation queue not visible to mere mortals. But my real talent seems to be using DNS records to try to shoot myself in the hard drive. A couple of years back I managed to take my math worksheets site offline with a DNS record change that I thought was working fine because of a forgotten localhost entry that resolved to the right address. When I saw a huge traffic drop in Google Analytics the next day, I immediately knew I’d messed up, but that brief span of time offline wiped out almost six months worth of SEO ranking progress. I’m a huge fan of Uptime Robot now. So you can bet, I’ve become pretty dang careful with DNS records pointed to my primary site. But, I’m also a developer. There’s that old adage, “Real Developers Test It In Production,” something you should not ascribe to, so naturally I sandbox development and staging servers on subdomains. And of course, a subdomain means a DNS A/AAAA record that needs your full attention. And that, friends, is the beginning of the reason why I got another Google Search Console email a couple of days ago and why I’m doing something different with my dev servers going forward. 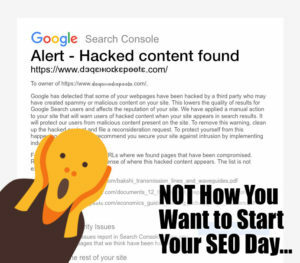 The obvious scary thing in the email’s subject line was the words “Hacked Content” and then, if that wasn’t enough to make every hair stand on end, the body text shouted “manual penalty” with a handy link right to the page on Google Search Console, which provided a big fat confirmation of every bit of bad news. Great. After I calmed down a bit, I settled in to see what was going on. 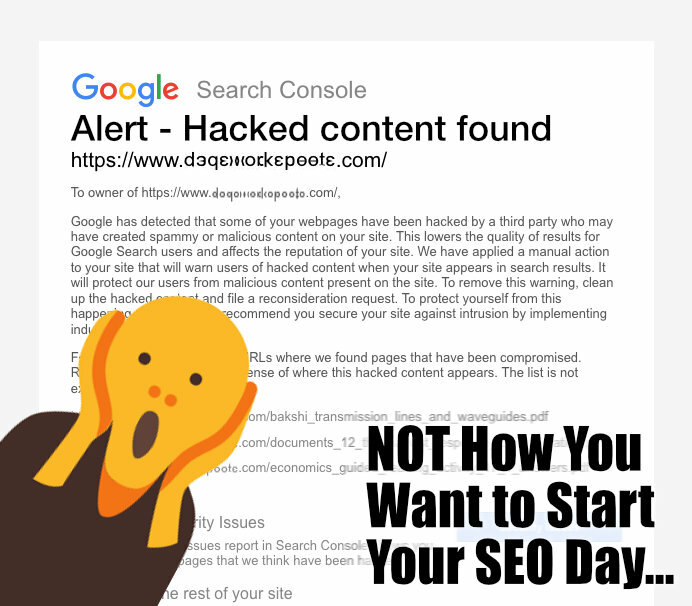 Google helpfully provided links to some of the pages that it claimed were hacked, and none of the URLs looked right at all. None were coming from the main www subdomain, which immediately lowered my heart rate, but even the URLs to the development subdomain they all referenced looked really weird. And then, it downed on me, that development subdomain wasn’t even around any more. I had decommissioned the server it was running under months ago, so that content couldn’t even be coming from a machine I was using. That server was gone, but its IP address was still resolving. And when I’d surrendered that IP address back to Linode, it meant that basically anybody else could start using a new server with that IP for their own purposes. So when someone else spun up a new site, it became reachable via a subdomain I still had defined. DNS induced brain damage, part two it seemed. So in this case, there wasn’t any “hacked content” anywhere, it was just that my DNS made it look as though I was serving duplicate content from some random site out from under a subdomain I controlled. And while the manual penalty suggested it was only relevant to URL patterns that matched that subdomain, it was also pretty specific that the manual penalty affected the overall reputation and authority of everything under the domain, so fixing it right away was a priority. The obvious and easy solution was just to delete the DNS record pointing to that subdomain, wait for propagation and then file a reconsideration request through Search Console. Even though the reconsideration request indicated that Google took “several weeks” to review anything, I did thankfully get a follow up email in roughly 36 hours that said the penalty had been removed. I’m not sure if I took a short term traffic hit or not on the main domain as all of these events transpired over a weekend, and the traffic pattern for this site drops off significantly there and around the holidays in general. Otherwise the site traffic looks normal in spite of the brief stint with the manual penalty in place. So far, it looks like I dodged whatever bullet might have been headed my way. I think an important contributor to this rapid turnaround and preserving rankings was that I fixed the issue rapidly and explained in clear detail in the reconsideration request what happened and how I resolved it, and specifically that it wasn’t actually an actual malicious hack. But the key take away is not just to be super careful managing your DNS entries, but also to run any publicly visible development and test boxes under a domain that has nothing to do with your main property. If this had been an actual hack of a machine we were using for something critical, and maybe one that appeared more malicious than serving duplicate content, that manual penalty could have had a real negative financial consequence for the main site. It’s hard enough to secure a production server, but a development machine that is transient in nature is probably going to be less secure, and potentially a softer attack vector. SEO is hard work, and shooting yourself in the DNS is pretty easy. If a hack, or even just a DNS misconfiguration, of a dev machine can lead to a manual penalty that affects not just the subdomain, but your entire web property, it’s much wiser to have it far away from your main domain. In the future, I’ll be running any publicly visible dev machines under an entirely different domain name for this reason.